Is AOC This Leftist Group's Manchurian Candidate? Is AOC This Leftist Group’s Manchurian Candidate? The truth has a way of making itself known and freshman Rep. Alexandria Ocasio-Cortez (D-NY), also known as “AOC”, is learning that the hard way. The New York Democrat has been removed from the Justice Democrats PAC board of directors days after legal experts questioned whether it was legal for her to serve on the board of a PAC at the same time that it was raising over $1.8 million for her campaign. Making things more interesting, a story has been circulating that the same Justice Democrats PAC fielded interviews with some 10,000 applicants to find the perfect candidates to push their agenda in Congress. “AOC” was among the applicants chosen and groomed for office. On the organization’s website, the background features AOC and fellow leftist US Reps. Ilhan Omar (D-MN) and Rashida Tlaib (D-MI). The platform is one of self-proclaimed “bold, progressive action” that will “transform America”. They say they’ve elected seven members of Congress and are organizing another slate of candidates for the 2020 election. 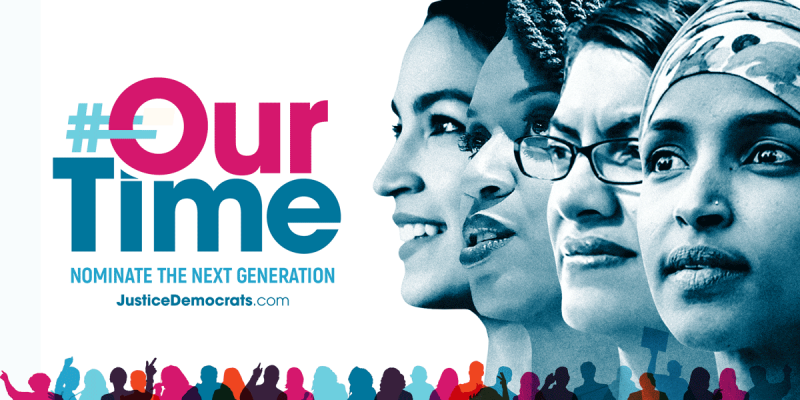 The home page of their website promotes “medicare for all”, “green new deal”, and “racial justice”. Translation: socialism, command economy, and reparations. It also claims to boast 350,000 supporters and encourages site visitors to “nominate the next AOC”. The “About” page says the goal of Justice Democrats is to “elect a new type of Democratic majority to Congress…” The organization’s facebook page has 100,000 likes while the Twitter account has over 150,000 followers. It appears that the Democrat Party has a full-blown inner-party rebellion on their hands, one that will accept nothing less than a new Democratic Party that fully embraces their far-left platform. The good news is that the moderate Democrats and socialist Democrats are at each other’s throats. The bad new is that if the socialists win, the nation could be in for a huge pendulum swing to the left in 2024.